ABOVE: As you leave the station, you'll find yourself in downtown Versailles. From here, it's a quick walk to the Château de Versailles. 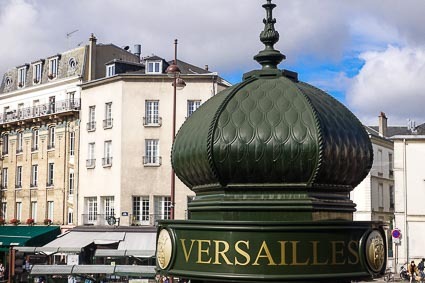 Versailles is a popular excursion for tourists in Paris. Many visitors buy expensive bus tours and let themselves be herded around at the former royal palace and gardens. 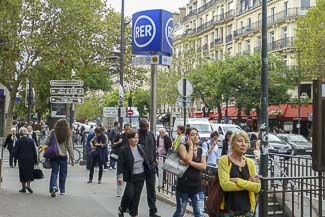 A much better option, in our opinion, is to take the RER "C" train from Paris to Versailles. After you get off the train, it's only about a 10-minute walk to the Château de Versailles, and you can spend the day enjoying the palace and grounds without being rushed. You can skip this step if you have a Paris Visite, Navigo, or Mobilis pass that's valid for zones 1-4. 2. 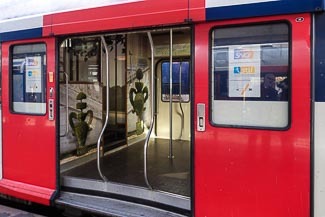 Using the Métro or RER (or walking, if it's more convenient), go to any station of RER Ligne C.
Popular "C" line stations in central Paris include St-Michel (near Notre Dame), Musée d'Orsay, Invalides, Pont de l'Alma, and Champs de Mars - Tour Eiffel. 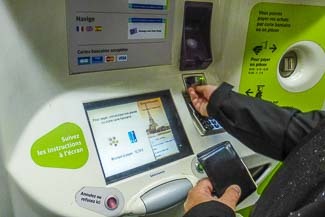 If you're coming from northern Paris on Line C1, you'll need to change trains at Champs de Mars - Tour Eiffel. 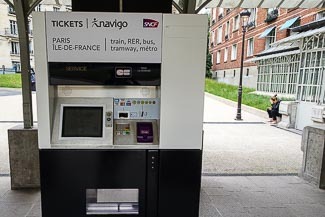 Be sure to save your ticket for use in the Versailles Rive Gauche exit turnstiles and, in some stations, for changing between the Métro and the RER. 3. 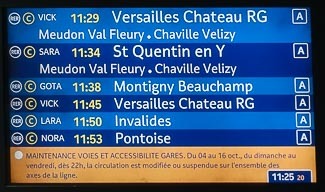 Check the station monitor for "VICK" trains to Versaille Chateau RG and go to the platform indicated. 4. Board the train when it arrives. 5. Settle in for the trip. 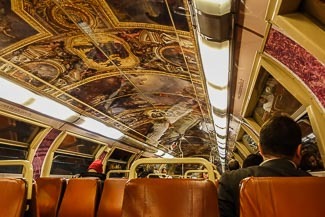 If you're lucky, you'll be on a train with a decorated ceiling that gives you a foretaste of the palace at Versailles. Exit through the turnstiles, using your ticket, and leave the station. Follow the signs and the crowd to the Château, a.k.a. the palace and gardens. You can check SNCF train schedules here, using the SNCF Transilien journey planner. See the palace's official Web English-language site at en.chateauversailles.fr.